The LS300G is a cellular gateway for use on GSM/GPRS/EDGE/HSPA+ networks such as AT&T, Rogers, Bell, and Telus. The LS300G comes standard with Ethernet, USB, and serial interfaces, making it easy for you to configure, deploy, and connect it to Campbell Scientific data loggers, cameras, radios, and more. To read their bulletin, go to https://source.sierrawireless.com/~/media/support_downloads/airlink/docs/technical%20bulletin/swi-psa-2018-002%20technical%20bulletin%20-%20reaper%20-%2029mar2018.ashx?la=en. From the Sierra Wireless website: "Sierra Wireless has confirmed reports of the 'Mirai' malware infecting AirLink gateways that are using the default ACEmanager password and are reachable from the public internet. The attached technical bulletin provides information about Mirai along with instructions on how to protect your Sierra Wireless gateway and its local area network." To read their bulletin, go to http://source.sierrawireless.com/resources/airlink/software_reference_docs/technical-bulletin/sierra-wireless-technical-bulletin---mirai/. Sierra Wireless takes such threats seriously and is actively working with law enforcement, network operators and affected customers to conclusively determine the source of the malware and assist in remediation of affected devices. The LS300G is a cellular gateway (also commonly referred to as a cell/cellular modem). It is locally and remotely manageable using Sierra Wireless's ACEManager™ web interface or AT and AToIP commands. Please note the power requirements for this device. The LS300G draws significantly more current than the RavenXTG. In many cases, a station that leaves the LS300G on continuously will require at least a 50W solar panel and an 84 Ah battery (10 days of battery reserve). As such, most users will attach the power input of the LS300G to the SW12 port on the data logger or to a power relay controlled by the data logger. 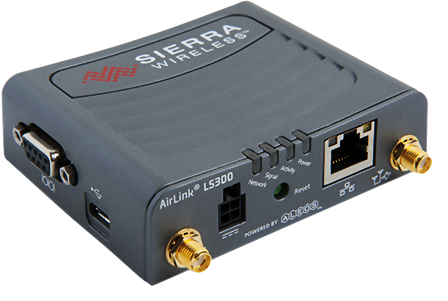 This product uses the LS300G Sierra Wireless SL8090 radio module. Contact Campbell Scientific if you require WCDMA operation at 900/2100 MHz (SL8092 radio module). The LS300G will connect to any of our devices that have an RS-232 serial or Ethernet port. When connecting the LS300G to an RS-232 DCE device such as the CR1000, use the 18663 Null Modem Cable. When connecting to the CS I/O port of a data logger, use the SC105. When using the LS300G as a replacement for the RavenXTG, ensure that your station's power supply and recharge are adequate to handle the increased power consumption when active. For use with the LS300 modem on AT&T and other (GSM) networks. These template files are used with the Sierra Wireless ACEManager to configure the AirLink LS300 modem to communicate at 115200 or 9600 baud with the datalogger. The templates will configure the LS300 for both serial server or PPP (point-to-point protocol) with the mode being determined by the datalogger. Using PPP allows access to the dataloggers IP capabilities (Email, HTTP, FTP, etc). The CR800, CR1000, CR3000 and CR6 dataloggers support PPP. What should be considered when attaching a cellular modem to a CR200(X)? When connecting a cellular modem to any device via the RS-232 serial port, consider the baud rate required by the device that is being attached. For example, when connecting a cellular modem to either a CR200(X) using a 18663 or to a CR10(X) using a SC932A, the RS-232 baud rate of the cellular modem should be fixed at 9600. For these devices, 9600 baud is the default baud rate.